Can Xargay is a millennial traditional catalan house of XI century with a special charm situated in the village of Mata. Restaurants and shops are situated in a walking distance. The supermarkets and the hospital are located 1 km. from the house. Outside, there is a covered porch with a barbecue which is ideal for eating outside all year round, swings for children and a nice heated private swimming-pool with an hydromassage bench. It is appropriate to spend some days with the friends, family reunions, partying, birthdays… or just to spend some calm and break days. The perfect situation of the house allows you to do several excursions around Pla de l’Estany by bike or on foot, through the lake surroundings declared of natural interest. You can also visit Girona province since the house lays in the center of it. Car is not necessary because 300 meters from the house there is public transport (bus). Private transfers from/to Airport are available. HIKING: There are some walking routes from Can Xargay. They have trail markers and are organised in a network of loop trails, and hikers can adapt the route or the stages according to their requirements or level of preparation. GASTRONOMY: Culinary excellence is a virtue which is common to all the regions of Girona. You will always be able to enjoy the pleasure of natural, traditional, sophisticated, creative or even ingenious cooking. 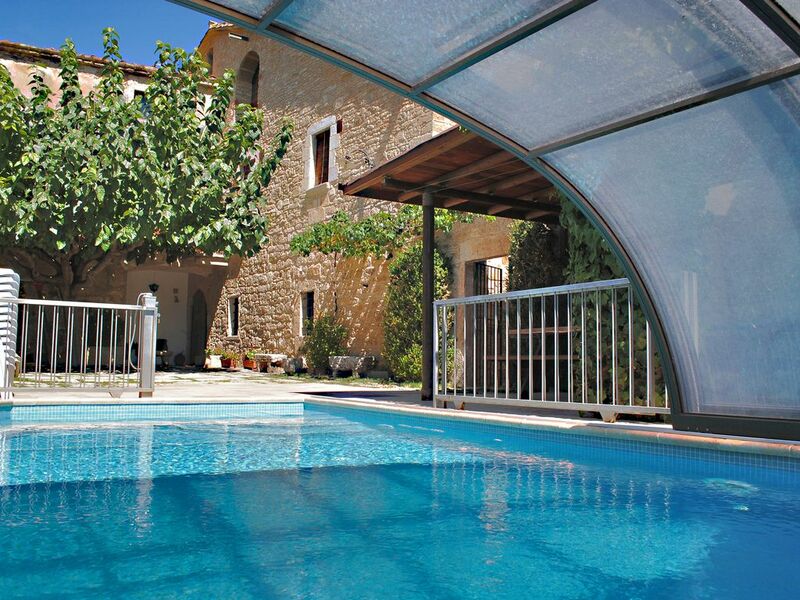 GOLF: The house is located 9km from Girona Golf. It's an 18-hole, par 72 golf course designed by the English architect F.W. Hawtree, seeded entirely with Penncross, the best quality grass for playing golf. A course that is entirely adapted to its natural surroundings, featuring an advanced sprinkling system using regenerated water from Girona's purification plant, and meeting the most up-to-date environmental standards. The top nine holes are extremely competitive – their design requires players to use all the clubs in their bags. The bottom nine are simply spectacular, with all the tees set atop walls built with Girona stone, offering impressive panoramic views of the fairways. It is a true pleasure to follow the flight of the ball towards its destination, and encourages many players to take out their woods. The villa has got all the benefits that you will need. For example, there are wifi access, TV satellite (to see international channels in your country), there is a swimming-pool with an hidromasage bench (just for you), it's very close to the shops and restaurants (in a walking distance). Car is not necessary because there is public transport only 300 meters from the villa. And so on... We are sure that you will like and enjoy it!! The swimming-pool is heated from September to June. There is a fee in order to heat the swimming-pool that it depends on the month. The pool will be closed in December, Januray and in February. Can Xargay brings you closer to the senses world through a wide range of relaxing therapies where time will stop and your senses lead you to an exotic world of sensations. All services are offered by Sandra Xargay, a licensed physiotherapist (number 11.452) in Can Xargay wellness center. All products used are 100% natural. Nos lo hemos pasado genial con toda la familia. Hemos disfrutado de la barbacoa, la piscina y de la sala de juegos. La casa muy confortable y muy limpia. Gracias por todo. Consultar los precios de la piscina climatizada en temporada baja en función de la época del año. Tarifa en función del número de personas. La tarifa de precios detallada corresponde a un grupo de 16 personas.